Find a moment to melt a little everyday! 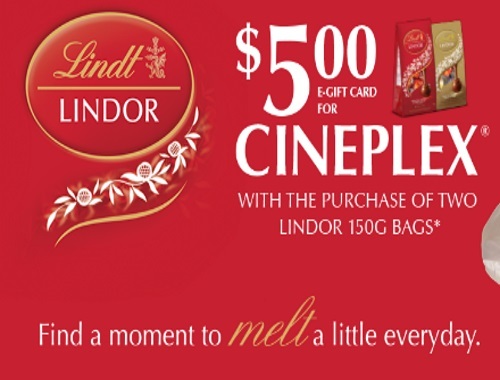 Lindt has teamed up with Cineplex for a Lindor Movie Night offer! Get a $5 Cineplex e-gift card reward with the purchase of 2 Lindor bags. 3. Receive your $5 e-gift card valid at Cineplex theatres or Cineplex.com. One e-gift card per valid receipt. *Free $5.00 Cineplex e-gift card reward with eligible purchase of two (2) Lindor 150g bags in a single transaction at any Canadian retailer between April 20, 2017 and June 15, 2017. Receipt must be submitted between April 20, 2017 and June 25, 2017. Eligible receipt must clearly show the date of purchase, receipt total, and product name or UPC. Each eligible receipt is valid for a $5.00 Cineplex e-gift card reward towards general admission or concession at Cineplex theatres and on Cineplex.com in Canada. Additional restrictions may apply. Consumer is responsible for any remaining balance if purchase price exceeds the credit. Cineplex e-gift card reward cannot be used with any other Cineplex promotion. Open to Canadian residents of age of majority. Limit of two (2) Cineplex e-gift card rewards per household. Message and data rates may apply. Valid in Canada only, while supplies last. Click here to check out this offer.